Western Montana holds an abundant amount of natural hot springs that seep from the ground forming pools of hot mineral spring water that will ease your aches and pains while sending you into deep relaxation. Let a full moon lead the way to Jerry Johnson. Enjoy the hot springs of Bob Weir under cedar canopies and jagged rock cliffs. Proper amenities will greet you at Lolo Hot Springs. “Limp in, leap out,” in Hot Springs, MT. Take a dip at Lost Trail Hot Springs after a hard day on the slopes. Natural hot springs are Mother Nature's gift to the explorer in need of a bit of rest and relaxation. The west, especially west of Missoula, is full of geothermal activity which means a plethora of hot springs seeping out of the ground. Some are developed, others primitive, but all will make you go awe. Technically located in Idaho, though Missoulian's claim it as their own. Unlike the 'pools' found at other hot springs in the area, Jerry Johnson is all natural all with three different and unique hot spring pools to choose from. Location: From Missoula, take Hwy 93 south to Hwy 12 west. There is a clear sign, although it is of the rustic forest service type, and parking on the right side of the road. Climb down the embankment, over the bridge, take a right on the very well padded trail for about a mile, and then pick a pool. Activities: Hike in, strip down, suit or bare bummed, soak and relax. You are sure to enjoy some conversation as well as these pools are often crowded. Season: Located in the Clearwater National Forest, this primitive hot spring is yours to enjoy year-round, especially nice during the winter months. The spring run off does wash out the lower pools along the creek. Rock cliffs and cedar stands set the scene for tranquil times at the Bob Weir Hot Springs, an undeveloped hot spring in Clearwater National Forest, ID. Location: From Missoula, take Hwy 93 south to Hwy 12 west. It will take about 2 ½ hours. In the summer a sign should be visible around mile marker 142, with a generally full parking lot opposite the creek. In winter, the sign tends to barely hover above the snow line. 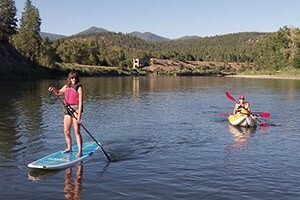 Activities: The hike is only about a half mile then you can settle in to one of the 100° temperature pools. Don't feel like leaving this cedar canopied oasis, pitch a tent at one of the two campsites. Season: Open year-round, but if visiting in the winter be prepared to hike in heavy snow. The Lolo hot springs were used by Native Americans way before Lewis and Clark wondered up the mountain. Early settlers used to post testimonials about the healing qualities in the local paper. Today, Lolo Hot Springs captures the mineral hot springs in a convenient pool for your easy access and enjoyment. 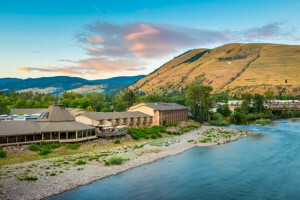 Activities: In addition to a soak in the hot spring filled pool, enjoy the volleyball courts, live music, the restaurant, and if your tired at the end of the day, even the lodging. After a day on the slopes of Lost Trail Powder Mountain or cross-country skiing at Chief Joseph's Pass, the Lost Trail Hot Springs is just what your muscles need to releave a bit of the ache. 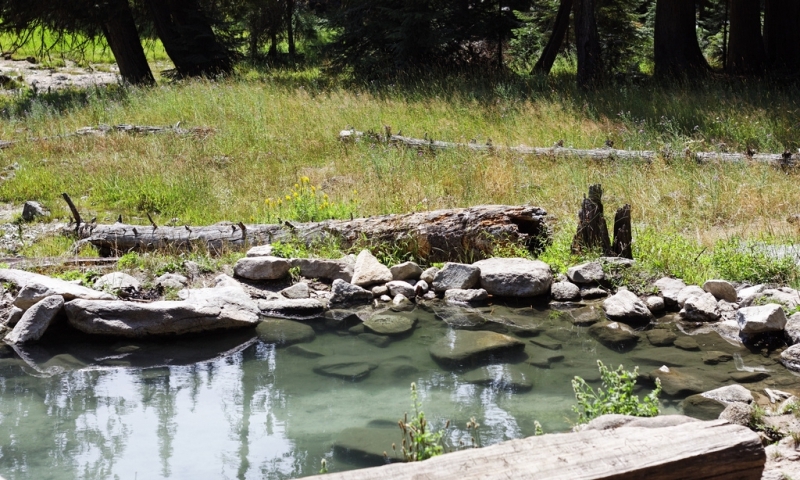 Activities: Lost Trail Hot Springs features a 'hot springs pool,' a chemically free swimming pool filled with water from the sight's natural mineral hot spring. Soak in the 94º to 95º pool or for a bit more heat the hot tub averages 104º. Swimming suits required. Bring your own towel. Location: Located 75 miles north of Missoula, take Hwy 93 north to Elmo, the junction with Hwy 28, head west to Hot Springs. Activities: After your soak in the hot springs, enjoy the town as you munch on a pastry from the bakery or wet your palate with a cold one at the bar. Hot Springs may be a sleepy town but it's still quit alive. The Symes Hotel and Resort sets the mood with flamingo pink walls and a 1940's vibe, but don't let that detract from the main attraction, the hot mineral pools filled with natural spring water. Activities: When you tire of bathing grab a bite to eat at the hotel restaurant. Fees/Cost: Use of pools included in the price of a room.